On June 7, 2006, I was fortunate enough to produce three of my favorite photographs of all times. Two are contest finalists, and all three are framed and on display in my home. I had previously purchased this starfish at the local shell shop with the intention of using it as a prop in some of my beach photographs. “Are these shells from around here?” I asked the proprietor. “No,” she replied, “We don’t get shells like these on our beaches. These come from the Philippines.” A day or two later, with my Philippine starfish still in its original bag, I headed off to the beach with Sandra, where I photographed “Sandra at Sunrise” (see separate post for details). Thirty minutes after making that photo, I shot the starfish by itself lying on the sand, with the low morning light raking across it and the sand ripples. I had already spent several days at St. Simons, and I was frustrated by the clear blank skies that imparted dull lifelessness to my landscape efforts. But when I got this shot framed, and I looked through the viewfinder, I knew I had a winner. The starfish provides the entry point for the viewer's eye. 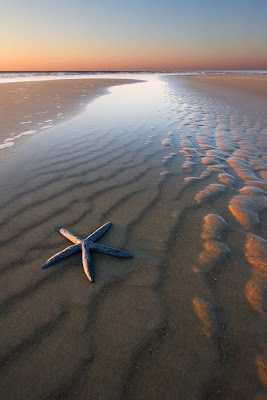 The sand ripples and the shimmer of light take the eye to the horizon, where in the absence of clouds, there is a lovely gradation of color, repeating the blues, browns and oranges of the starfish and beach. While shooting this starfish, I heard excited footsteps heading my way. I looked up to see a young boy pointing at me while crying out to his mother, “Look what he just found!” I quickly told him the truth about the starfish’s origins, and then I went back to shooting, before I could gauge his reaction. For this shot, I had to lie face-down in the wet sand. This was a second-place winner in BetterPhoto.com’s photo contest. Canon 20D f/8 1/13 sec. ISO 100 10-22mm lens @ 10mm.